Support - Personal Coaching For Deciding Whether To Have Kids Or Not - Kids or Not? It's understandable if you are having difficulty deciding whether you want to, or should, have children or not, or when you should. It's a big decision, and it usually involves many emotions and considerations that can be quite complex and overwhelming to work through on your own. If you are feeling confused or stressed trying to make this decision, then you could benefit greatly from some professional and personal support. It is designed for people who would like personalized help with these private and difficult decisions. Sometimes family and friends are too close to you and have their own opinions on what they think you should do so it is often beneficial to seek help from a more unbiased and non-judgmental form of support. Personalized support can help you work through your thoughts and emotions, develop further insights, work through fears and anxieties, explore solutions to issues, and assist your progression in the decision-making process. 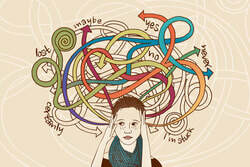 Maybe you have been struggling with the decision for months or years, or perhaps your situation is a complicated one. You don't need to go through this struggle alone. I have helped many people find solutions to their complex situations, and answers to their difficult questions. I can provide the skills, structure and non-judgmental support needed to help you decide whether to have children or stay childfree. If you want to know more about me and why I can help you go here. I offer my personal support sessions via email so that I can help people anywhere around the world at any time. 2. A reply email from you with responses to the exercises and questions which explain to me your thoughts, feelings and concerns about the issue and your specific situation, and an opportunity to write whatever else you wish to include as well as ask any me any questions. 3. I will reply with a detailed email which includes my thoughts, feedback, and responses to your questions. After clicking the button you will be taken to a payment page. Once your payment has been submitted you will receive an email that includes a payment receipt along with information from me to start the support session. For some people the initial 3-step email support session is enough, however if you would like more support following this then you can easily keep adding on another email exchange (one from you, followed by a response from me) for $80 USD. You can add on extra steps if and when it suits you from a link I will provide you during the initial email session, however, there is no pressure to do so, and no restrictive time frame on how and when you can add on. If you feel you would need or like more than 10 email exchanges then just let me know after the initial package and we can discuss how many emails sessions you would like and arrange a discounted fee. "Your support was very comforting and most importantly, helpful. You were compassionate and understanding but also to the point with lots of practical advice and insights. You helped me to pinpoint and deal with the issues that were holding me back from reaching my decision. With much gratitude, Alex C."
Would I be happier with kids or focusing on me and my career/partner? Why do I want kids? And is it for the right reasons? What do I do: I want kids but my husband doesn't, or, I don't want kids but my husband does? Family and friends are pressuring me to have a baby - how can I cope with it? Will I be a good enough parent? I can provide the skills, structure and non-judgmental support needed to help you work through these difficult questions. Private and confidential. Nobody has to know you're seeking help but you. Convenience: you are not restricted to an appointment during office hours, you can email at midnight in your pj's from the comfort of your own couch if you like! And there is also no travel time or costs to worry about. It will not be registered on any medical records which could affect health insurance, life insurance etc. Some people find it less confrontational and less stressful as you do not need to open up and discuss personal issues to a person face-to-face. You can feel more free to express your deepest thoughts and emotions in the privacy of your own home. The act of writing your thoughts and feelings can be therapeutic in itself (like journaling) and also provides an automatic transcript for you to refer back to if and when you feel you need to. The nature of email support enables both parties the opportunity to reflect on thoughts, feelings and other reactions to the other person's words. Often more time is spent reflecting on a given statement by the client and the corresponding responses than in face-to-face exchanges, thereby creating more effective responses and more time for the client to process and review exchanges. I can help people anywhere in the world at any time - I am not limited to office hours and to people who only live locally. If you have any questions about Support Session please check out my FAQ page or Contact Me.